The Links was the first to open for play in 1996. At the time it was the most expensive nine-hole golf course ever built. This was due primarily to unexpected costs involving the kiln dust left over from the former cement plant. Many people who watched the construction process from start to finish felt that in its early stages of construction, The Links looked more like barren land you might find on the moon than a potential golf course. In its current state, The Links is a beautiful layout that follows the shoreline of Lake Michigan very closely, giving it a rugged Scottish feel while at the same time highlighting the magnificence of Lake Michigan The hole most remembered on The Links layout is Number 7, a par 5 that play 490 yards (Blue Tees). Given the scenery on this hole, it may the most memorable of all 27; it certainly is picture worthy! Not only that, but it's a great risk/reward golf hole. From the Blue Tees it plays 490 yards. 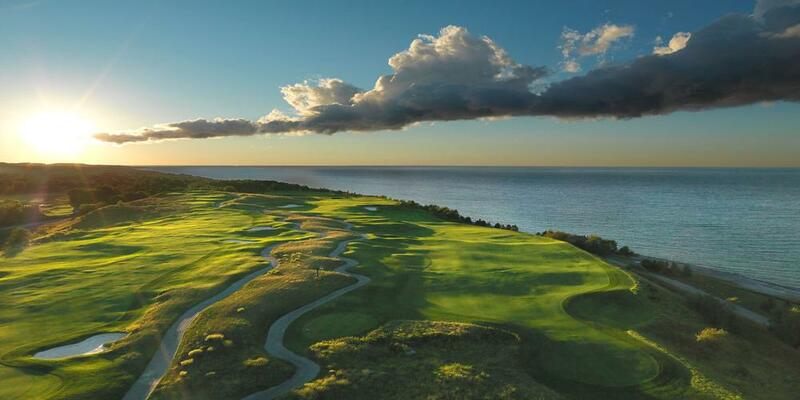 The hole hugs the Lake Michigan coastline down the entire right side, so it is best played down the left. The fairway is pretty wide and a well-struck tee shot will give you the opportunity to go for the green in two. Even if you don't quite make the green, the landing area is very generous short of the green. The scenery that plays out as you make your way down the fairway is absolutely incredible. 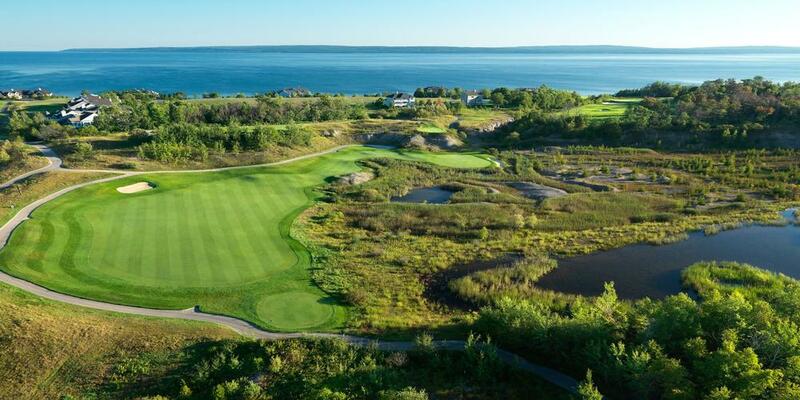 The Preserve was the second course to be completed and does a great job of showcasing Northern Michigan at its finest. Its designed to allow golfers to experience the thrill of nature as if they were actually playing through a nature preserve. You'll find an abundance of wildlife as well as dense hardwoods, all leading to lush fairways and greens. Be careful while you're out there or you may just be consumed with the peaceful serenity that surrounds you. The course is built over rolling and tree-lined terrain that features subtle elevation changes and a generous amount of mounding on the fairway peripheries of the landing zones and around the greens. 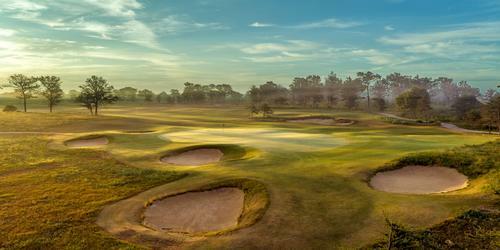 The signature hole on The Preserve is the par 5, 4th, which plays 542 yards from the Blue Tees. The neat thing about No. 4 is that there are a few different ways the hole can be played. Three fairway bunkers are strategically located in the middle of the landing zone off the tee; regardless of where you play from. This bunker complex divides the fairway in half. The left is preferred by most and provides the best view of your next shot whereas the right creates a blind second shot. Club selection is critical on your layup shot; you want to leave a short iron or pitch shot into the green which is fronted by a pond and slopes front to back. For most players it's a three-shot hole as the risk greatly outweighs the reward. The Quarry nine at Bay Harbor Golf Club was the last course completed. It features 5 holes built around a shale quarry giving the layout a rough, industrial edge with a dramatic finish. The Quarry will undoubtedly be one of the most unique experiences you ever have on a golf course, with spectacular views along the way. 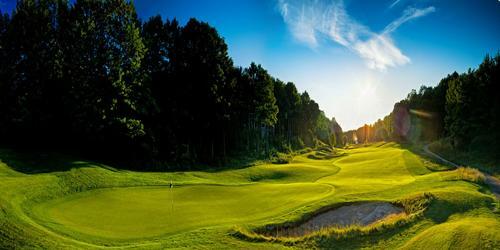 The Quarry nine finishes with dramatic routing along the shores of Lake Michigan and some of the most picturesque finishing holes that you'll find anywhere. It's no wonder many people refer to Bay Harbor as the Pebble Beach of the Midwest! The Quarry's Most Memorable Hole is Number 8 a Par 3, that plays 172 yards (Blue Tees). It's yet another hole where the Lake Michigan coast steals the scene. This par 3 plays downhill to a green fronted by a rock-walled pond with Lake Michigan behind the green. The toughest part of this hole is choosing the right club, depending on the wind it could be +/- up four clubs. Ever hit a driver on a par 3? 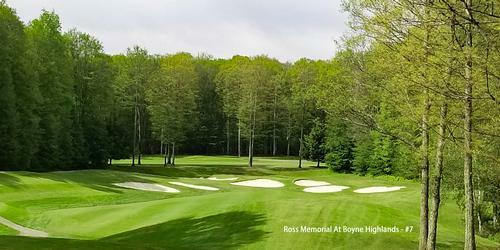 Boyne Resorts has received numerous accolades from several national publications including Golf, Golf Digest, Golf for Women, Michigan Golfer. They've even landed several layouts on Golfweek's Top 100 Resort Courses in the Country. However Boyne is not only recognized for their outstanding selection of world class golf facilities, but also for their accommodations. 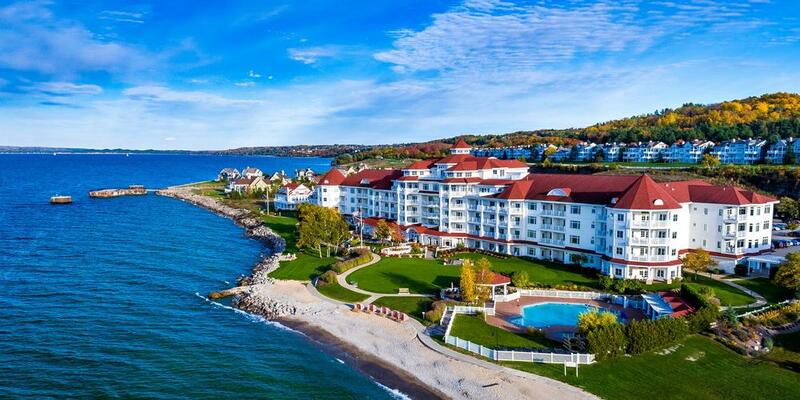 The flagship property of Boyne Resorts is The Inn at Bay Harbor and its design pays tribute to the grand hotels of the late 19th century. In 2014, it was voted one of Travel + Leisure Magazine's Top 500 Hotels in the World. 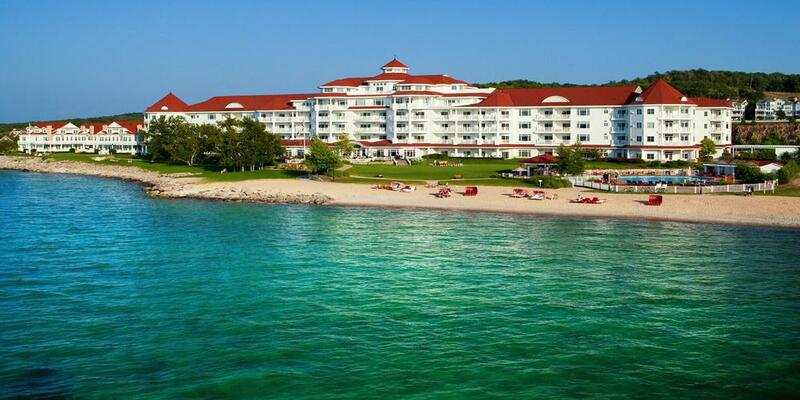 The Inn is truly a luxury resort and is located literally steps away from Lake Michigan with its own private beach. 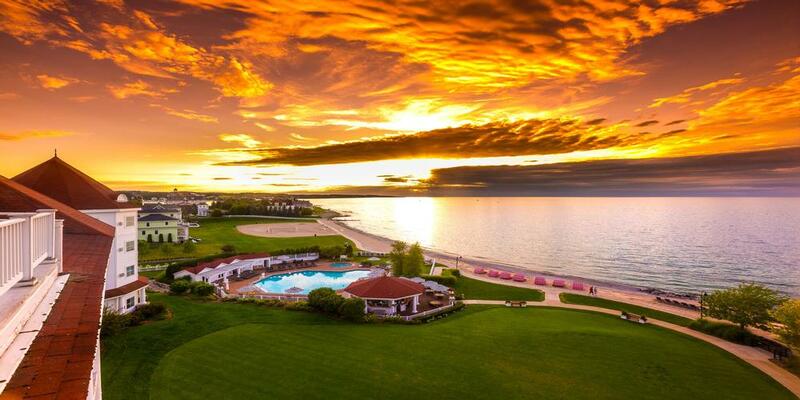 It's a perfect place to watch the sun set over Lake Michigan and exemplifies everything Boyne Resorts stands for. The Inn offers a variety of accommodations that include standard rooms and comfortably appointed suites. 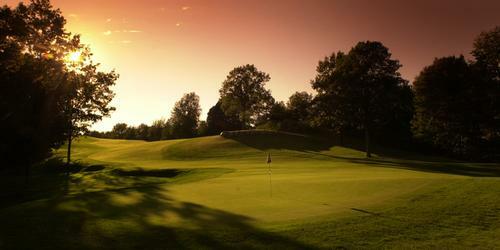 Even if golf isn't your game, odds are you'll find something you enjoy doing at The Inn at Bay Harbor. There is a spa and a fitness center equipped with the latest cardio equipment. There's also an outdoor pool area with hot tub. Outside you'll find croquet and sand volleyball courts as well as an outside chess/checker board with pieces that are about 3-feet tall. 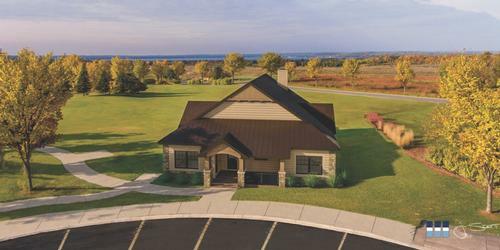 The clubhouse also offers up fantastic views of the lake. Inside you'll find a beautifully stocked pro shop, men's and women's locker rooms with showers, a restaurant/lounge as well as meeting and banquet rooms. During the summer, you can dine on the patio with beautiful views of the lake. Before your round, warm up on Bay Harbor Golf Club's practice range which features a targeted grass range. There's also a short game area complete with sand bunker and putting greens near both the pro shop. Last Word: Bay Harbor has it all: long, treacherous forced carries off the tee, numerous elevation changes and plenty of sand and water hazards throughout. When the stunning blue waters of Lake Michigan are not before you, you'll most likely be staring down old stone walls from the quarry. Each hole leaves you wondering what's next! That said, Bay Harbor is not exactly a resort-friendly golf course, although that's not to say that you won't have a good time. If you're a serious golfer, you'll appreciate the fact that each nine demands pinpoint accuracy and a solid mental game in order to score well. If you're just out for fun, Bay Harbor will provide you with some of the most amazing golf course photo opportunities available in the US. Be sure to take a camera! The courses are like nothing I have ever played before.